Swimming in the morning and skiing in the afternoon? You can do that on the French Riviera comfortably--for at least a few months a year. Many slopes are less than two hours from the beach. The proximity of the ski slopes to the coast is one of the prime attractions of the Cote d'Azur. Expect to pay from €15-30 for lift tickets for the day. Naturally the slopes are much less crowded during the week unless it's during school holidays when you can expect long lift lines. Go during noon and 2pm (lunchtime) and you'll have the slopes nearly to yourself. Saturdays are busier than Sundays. It's the region's largest and highest; there's snow here long before and after other slopes are bare. 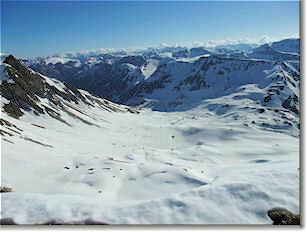 This is the preferred resort of many locals; it's an attractive ski station. This is a nice family-style resort. Cross-country skiing at Beuil. It's big but the architecture is unattractive. 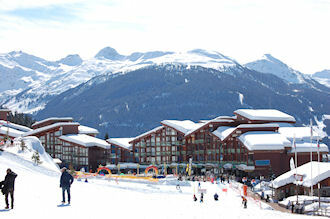 A large familial resort and an attractive ski station. Close to the coast with views over the sea. Another place to enjoy sea views from the top of the mountain. Some cross country trails. Small and a pleasant village atmosphere. A tiny resort and the closest to Nice. Some cross-country trails. "Little Switzerland of Nice" with a lake and towering pines.